Microsoft unveils Surface Windows 8 tablets to rival iPad | What Hi-Fi? 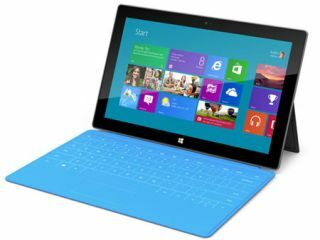 Microsoft is taking on the mighty iPad with the launch of its family of Surface Windows 8 tablets. They have bigger screens than the iPad, but are heavier. Microsoft Surface will come in two forms: one running Windows 8 Pro on an Intel Core i5 Ivy Bridge processor, and a more mobile version running Windows RT on a Nvidia processor. Both tablets have bezeled edges angled at 22 degrees, with shells made from VaporMG – a new material that apparently offers the tactile finish of a high-end luxury watch. They will both come sporting 10.6in screens, front and rear cameras, integrated kickstands, full-sized USB ports and dual wi-fi for the best connection. The Windows RT tablet is the thinner and lighter of the pair at 9.3mm and 676g (compared with 13.5mm and 903g). It features a ClearType HD screen (resolution not yet announced) while the Windows 8 Pro version has a 1080p ClearType Full HD resolution display. Storage can be up to 64GB on the RT using microSD, and 128GB using microSDXC on the Windows 8 Pro Surface. The Pro also has a stylus with up to 600dpi precision and is powerful enough to hook up desktop monitors. There are some interesting accessories too. The Touch Cover is a 3mm, magnetically attached cover that includes a pressure sensitive keyboard. There’s also the Type Cover 5mm version that features physical keys and a multi-touch trackpad. The Microsoft Surface for Windows 8 Surface RT is not due out until around October, and the Surface Pro even later in early 2013. Pricing is vague but, according to our colleagues on Stuff.tv, expect to pay between US$600 (£380) and US$1000 (£635).